The first time we used the solar suitcase we may not quite have gotten the cool adjustable legs. RV solar is something I answer questions about a lot at the RV dealership. 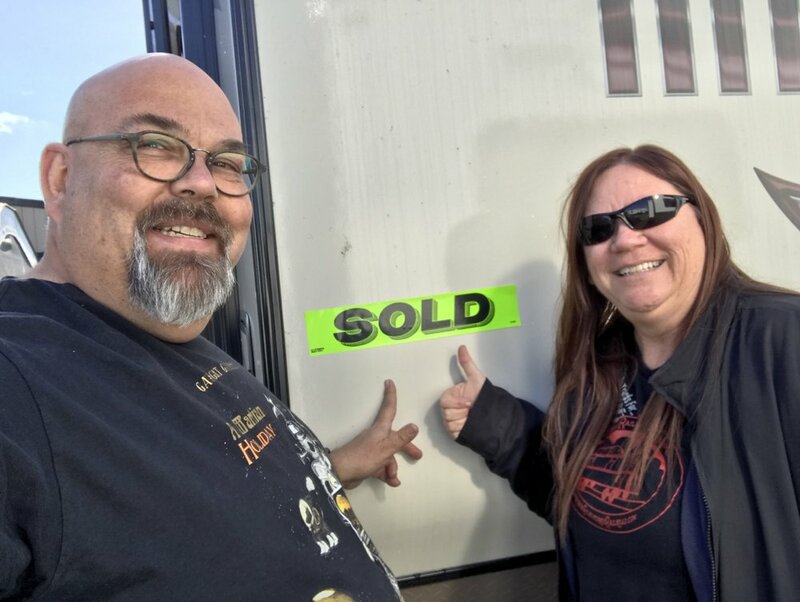 Many people wonder just what the new RVs can do with the solar plug that is becoming mainstream on the models we sell. There are so many configurations and options for RV solar that there is no one answer and definitely not one correct answer to be sure. There are two ways to look at RV solar in my opinion: as a total solution that powers everything in the RV or as a system for maintaining the batteries so that the 12 volt systems in the RV continue to operate. If you’re hoping to run the air conditioner, microwave or other 110vac systems in the RV or, perhaps, power some of the 110vac outlets in your RV, then you’re talking a very different game. If you’re boondocking and wanting to keep your batteries charged so that the 12v systems operate reliably that’s relatively easy to do and inexpensive which is the path I’ve taken. My chosen way of doing this is to run the 12 volt systems in the RV. To this end I want to maximize the amount of time I can run the RV on batteries so I’ve installed two six volt deep-cycle RV batteries on the trailer. Even with no charging whatsoever and taking advantage of the LED lighting and other efficient systems I can get several days’ use out of these batteries before they no longer meet the minimum capability to run the rig. Remember the things that run on batteries include your lights, obviously, but also the fan motor in your heater and the circuit board and igniter on the water heater and refrigerator. The water pump, too, is part of your RV’s 12 volt family. If you’re running truly “off grid” your fridge and water heater will be using the on-board propane to operate but do need this wee bit of electricity to keep their circuit boards running. If you’ve ever run the batteries truly low you’ll also realize that the carbon monoxide (CO) detector likes a properly charged battery and continually chirps when the battery(ies) in your RV are below 12 volt. Incidentally this will likely occur some time in the middle of the night because why would it happen during the day when you can do something about it? 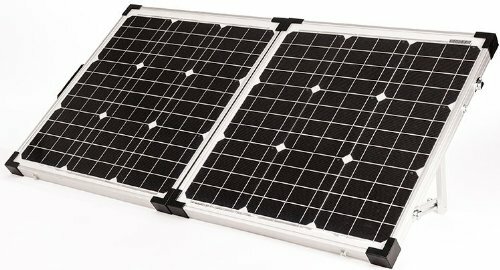 There are tons of options of running solar to keep your batteries in tip top condition for your RV but I’ll cut to the chase - I like the suitcase solar systems the best. When going camping I usually look for a nice, shady spot. The reason I feel this way is simple - when I go RVing I try to find a shady spot for the trailer so I don’t have to run the air conditioner and the whole point of a mobile vacation machine is to vacation where the weather suits my clothes. So it stands to reason that if I park the trailer in the shade, solar panels are not very effective. This is why I don’t have solar on the roof of the RV! A solar suitcase allows you to place it in a sunny spot and move the solar panels as the sun crosses the sky. This is very helpful for us as we spend every Christmas vacation at the beach in Northern California when the sun is less than ideal. Still, using an 80 watt solar suitcase that has a controller attached has worked really well in these conditions. In our case we simply plug this suitcase device into the included solar plug on our trailer and all is well. Not having such a plug is no big deal as it’s also really easy to wire the plug included with the solar panels right onto the battery terminals so you can plug/unplug the panels as needed. Also, I got a bicycle lock and attach my highly portable solar suitcase to something that is difficult to steal like a tree or picnic bench just in case someone wants to five-finger discount themselves into the world of solar. On my RV there is a 12 volt charging station so my iPad, phones and all of that can still be charged at night. The solar panel’s controller also has a USB charging port so you could charge a device during the day when the sun is out. If I did need to run a 110 vac outlet I could wire in an inverter or plug one into the “cigarette lighter” port on my 12 volt charging station, although I wouldn’t be able to run a high-draw item like a hair dryer. This would be good enough to charge a laptop, though. Should I have any hair to begin with and should it need blow drying it would be possible to use a larger inverter to power an outlet that would run a hair dryer or a toaster but now you’re talking much more complexity. Obviously based on houses that are totally solar-powered the sky’s the limit, but you also have to justify what you wish to accomplish and also what you’re willing to spend and haul. I’ve been very pleased with the simple solar suitcase I bought for the RV. It keeps the batteries on the up and up and was an affordable way to make my boondocking adventures last longer. But there are a virtually limitless number of solar choices under the sun.